At the beginning of ´88 TEEMU, JUHA and LASSE got together with an intent to form a band. The first songs were strongly in the veins of early SLAYER and SEPULTURA. Lyric-wise the band wanted to create something different from the other bands, texts were inspired on the basis of their odd dreams and visions influenced by surrealistic paintings. The name PHLEGETHON was found from a book about Greek mythology. 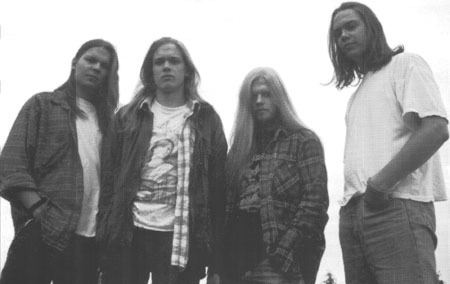 In ´89 the band recorded their first demo "VISIO DEI BEATIFICA". It contained 5 songs and the intro and the total playing time was nearly 30 min. The band suffered from the lack of bassist on the first demo, so they realized that they had to find one. So, they asked JUSSI, who had played in a couple of local bands earlier, to join the group. Of course he couldn´t turn down the offer and so was the line-up completed. Then it was time to start to consider recording another demo. "NEUTRAL FOREST" was recorded in June ´90 on an eight-track recorder. The sound on the tape was quite clear but not exactly what the band wanted. Anyway, this demo was very much praised in the underground metal scene. At the end of ´90 Phlegethon was offered a deal for an album by JAEGER of WITCHHUNT RECORDS. The band thought that they didn´t have strong material enough for the full LP so they asked if it was alright to make just a mini-LP. Jaeger agreed, and the band entered to the MIX MAN 16-track studio to record their material in February. Unfortunately the dudes weren´t satisfied with the first mix of "FRESCO LUNGS" with Teemu on vocals, so they had to go to the studio again in May to re-mix the record and to add new vocals, performed by Jussi. This time the production was much rawer and heavier than on the demos and the band had come closer to their goal. 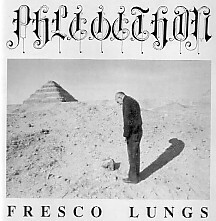 Later "Fresco lungs" was released also on CD with 2 additional tracks (as a bonus). The group played a couple of shows around their homeland and split up in ´92. In ´95 the guys got together just to record a few songs for fun and then go separate ways again. The tape was simply called "PROMO ´95". On that tape SAKU HURSKAINEN played lead guitar instead of Juha. In 2006 Lasse started composing material for Phlegethon again and the band came back with the new demo entitled "TOTEMS WITHIN".